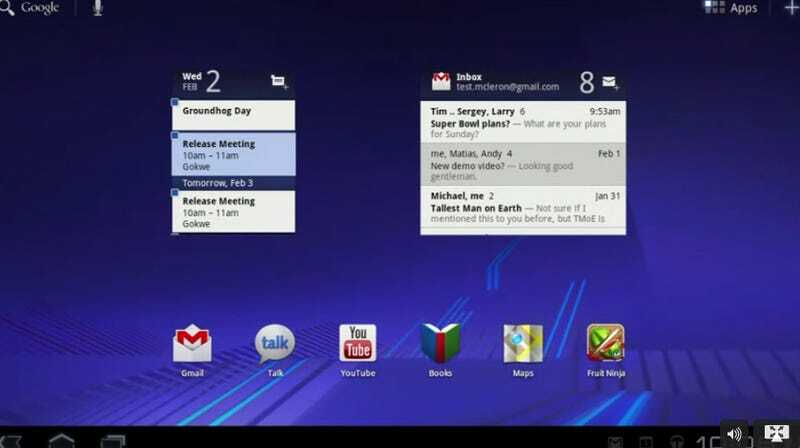 Here's the Android 3.0 Honeycomb homescreen for tablets. It's slightly different from Android's phone-interface to take advantage of the larger tablet-sized screen, which means there's even better multitasking and widgets. Updating. Besides this multitasking improvements, you also have improved notifications (popups in the bottom right corner). Developers can use these more advanced notifications using their API, which can include stuff like sounds, icons, music controls, and anything else that talks to applications. They're demonstrating Fruit Ninja now—the Android phone version. It works fine on the tablet, the same way iPhone apps work fine on the iPad. But they say they want to encourage people to develop tablet-versions of apps, such as Gmail below. The application bar on the top is something that changes when you interact with different objects and apps. For example, when you're in Gmail, it'll change to Archiving, Deleting and so forth—email actions. Here's how you customize the homescreen. They showed this to show off the new 2D/3D frameworks, such as the YouTube browser below, or the books app. The 3D page turning animations and scrolling are very smooth, but they're more eye candy. It's also good that the eye candy doesn't get in the way of performance though. More 3D demos: The Google Maps that was introduced in Android 2.3, and also the music app. Or, Google Body, the human body app. Next up is media capabilities. First is the new camera app. It's more advanced, functionality-wise, than the current Android camera, and works on both phones and tablets. Then, video chat. It's included in Android 3.0 Honeycomb by default. There's a contact shortcut widget on the homescreen, which you can use to email or video chat with someone. Here is the CNN app for Android tablets. It looks quite similar to how it is on the iPad, but, you know, more Androidy. It also includes live video, streaming from the US or internationally. The web store that we first heard about Google I/O is finally being released, today. You can buy apps from the web—meaning your computer—and install it automatically onto your phone. It functions the way you'd expect. You can browse through apps, click into individual apps to see reviews, an overview, ratings, screenshots and what's new in this version of the app. When you buy something, you can choose what devices you want to install the app too—filtered by devices that are compatible with the app, if you have, say, a phone and a tablet. Even Android phones can use direct links to the Android market instead of having to use QR codes or going into the Marketplace and searching. FINALLY. It is live right now, so you can try it on market.android.com. Also, buyer currency support is being introduced, so developers can enter in specific prices for different currencies. Oh, and in-app purchases is coming as well. A Disney guy is on stage talking about three apps coming to Android: Radio Disney, Jelly Car and Tap Tap Revenge. Now, Cee Lo is video chatting with a Google person. End of the presentation! Check out our hands on in a second.